The Leadership Insight journal is an invitation; an invitation to enter into the quiet and contemplation it takes to be wise. It is an invitation to find our true selves, and thus the essence of our best leadership. The names on the cover and in the journal are those of individual leaders from around the world. As we open the journal, we recognize that we are joining the global community of leaders who have made, and continue to make, a difference in the world. The image on the cover, a celebration entitled Exuberant Life, reflects the best of what we strive for as human beings and as leaders. Enter into the quiet and contemplation it takes to be wise. It is an invitation to find our true selves, and thus the essence of our best leadership. "Journaling on real paper with a real pen seems like a throwback to a different era. Until you try it. For leaders, finding that calm place where you purposely take the time to reflect is a powerful antidote to the rush-rush-rush of the rest of the day. 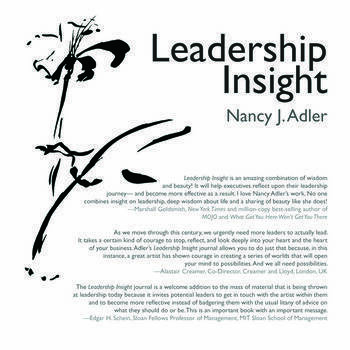 Nancy Adler has created a beautiful book that will draw powerful thoughts from you to the paper. You will love the results." -- Joel Barker, Futurist, film maker, and author of video "Innovation at the Verge"